On Wednesday November 29th, Brenda & Gary Farley along with AnnMarie & Bob McCarthy met with the Somerville, Massachusetts Mayor Joseph Curtatone, his wife Nancy, Director of Health & Human Services Douglas Kress and Director of Transportation & Infrastructure Brad Rawson to dedicate two BrightGuard Sunscreen Dispensers In Memory of their daughter, Keri McCarthy. These two Dispensers will be permanently placed at the Grimmons Park and Blessing of the Bay Boathouse on March 16th, Keri’s Birthday. Two very special locations. Keri passed away from Melanoma on May 21st, 2010 and her parents have generously supported our foundation throughout the years. Most recently, Keri’s brother Matthew and his fiancé Alyssa held an annual Halloween Party and donated the proceeds to our Foundation. 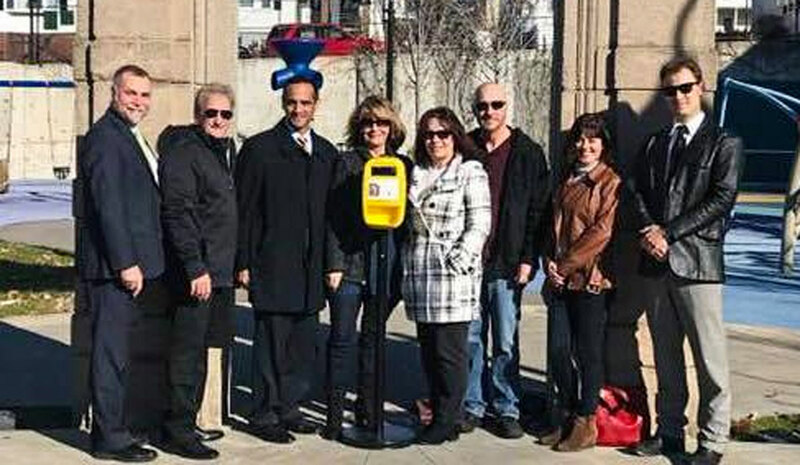 We are extremely grateful to the McCarthy Family and City of Somerville for placing these Sunscreen Dispensers In the city to help keep individuals safe from the sun. They are already planning on placing more of these in several locations so please stay tuned!